The machine's body is built by a single-piece structure with high tensile strength and tenacity. The side plate is built by inserting method with high precision. All connecting seams are sealed by heat-resisting silicon sealing material to prevent air leaking off. There is entirely no connecting material used at the seams. And it won't have the problem of leaking air or oil even after long time operation. 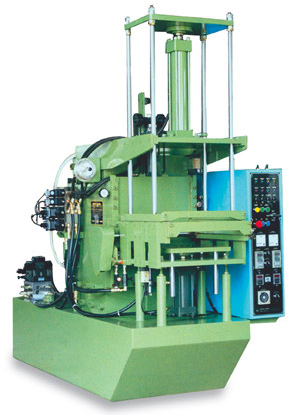 This machine applies Japanese YUKEN pump and plug in type integrated hydraulic circuit. The tiny volume makes an easy maintenance task and keeps off oil leaking out. This machine applies PLC programmable system to perform controlling task. The output is 24V/DC, free-of-contact. The electrical system is exactly same with the injection-molding machine that can sustain long operating life without the problem of breaking out the connecting points. Client can select the touch-operating type monitor and connect it with PLC system to build up a comfortable and smooth operating interface.